Land Destroyer: Soros-funded HRW Awards Soros-funded Prachatai Grant for "Bravery"
Soros-funded HRW Awards Soros-funded Prachatai Grant for "Bravery"
As reported by Thailand's the "Nation" daily English newspaper, "Chiranuch Premchaiporn, the embattled director of prachaitai.com, has become the first Thai to win the Hellman/Hammett Grant from Human Rights Watch for her commitment to free expression and her courage in the face of prosecution." 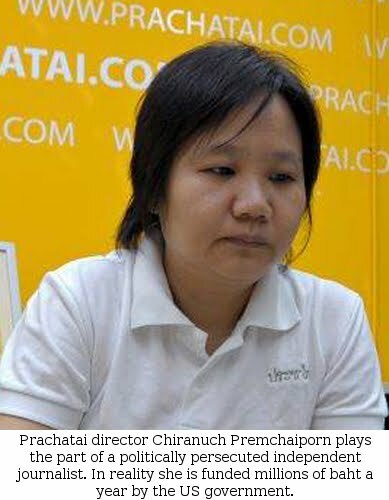 The author of the article, "Chiranuch wins award for her bravery," is Pravit Rojanaphruk, who has recently admitted that he himself is in fact a contributor to Chiranuch's Prachatai website in another article titled, "Transparency essential for democracy campaigner," where Pravit attempted to defend and spin Prachatai's extensive funding by the US government via the National Endowment for Democracy (NED) and George Soros' Open Society Foundation, and its dubious claims of still somehow being "independent." What Pravit predictably fails to mention in his more recent article is the fact that Human Rights Watch and Prachatai are both funded by George Soros' Open Society Foundation, completely undermining the legitimacy of either organization, let alone the "significance" of the self-aggrandizing endowment of "awards" on one another for "bravery" in the face of "persecution." Prachatai is an openly seditious organization funded by a foreign government and foreign corporate-financier interests to specifically undermine Thailand's national sovereignty, promote international institutions over local Thai institutions, and to faithfully re-post pro-globalist talking points out of Soros' organizations, including Amnesty International (page 10) and Human Rights Watch, as well as US State Department talking points promoted by the National Endowment for Democracy and the network of organizations it funds, including Freedom House, Reporters Without Borders, International Federation for Human Rights (FIDH), and Prachatai itself (listed by NED as the Foundation for Community Educational Media). 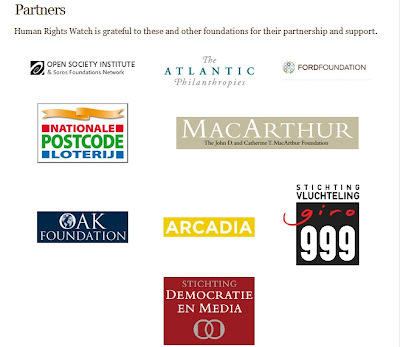 Image: Human Rights Watch, like Prachatai itself, is funded by George Soros' Open Society, as well as other corporate-funded foundations. HRW's bestowing "awards" on a fellow Soros funds recipient is a blatant public relations stunt attempting to lend the US government-funded propaganda front legitimacy where it is otherwise has none. A truly twisted web of conflicting interests, the US State Department and George Soros' myriad of self-serving, disingenuous "human rights" and "democracy" advocacy groups have never been above ridiculous displays of self-aggrandizing. The global elite assume that most people bearing witness to these PR stunts are oblivious to the fact that the recipients of these "awards" are also being funded by the awarding organizations, and that the entire mainstream rights advocacy movement is contrived theater, co-opted by the corporate-financier elite, with money trails all leading back to the Fortune 500, the Fortune 100, and eventually to a handful of Anglo-American banking houses. This isn't the first entirely contrived, dubious award Prachatai has received either. In May of 2011, Prachatai received the "Courage in Journalism" award from the International Women's Media Foundation (IWMF). The IWMF has a background that farcically betrays their stated cause and their lofty self-proclaimed image as a cutting edge women's advocacy group - as it is funded entirely by big oil, big banks, and war profiteering military industrial contractors - representatives of industries that have done more to undermine human rights, women's rights, democracy, and freedom than the rest of the world combined. Organizations they are supporting, funding, and doling out awards to, including Prachatai, most certainly aren't keeping tabs on rights abuses - but are instead tidying up Wall Street and London's competitors, leaving destabilized and fractured governments vulnerable to the slow creep of globalized corporate fascism. Once again, while disingenuous journalists attempt to lend Prachatai badly needed legitimacy, portraying them as hapless victims being unjustly persecuted and being honored with "prestigious" awards, a quick look behind the curtain reveals multi-trillion dollar foreign interests propping up yet another fraudulent propaganda clearinghouse with entirely contrived "awards," while their "persecution" turns out to be merely the organization rightfully being rooted out by local authorities for foreign-funded sedition. At this point, the Nation's Pravit Rojanaphruk has fully acknowledged Prachatai's foreign funding but continues on in earnest crutching the organization along on excuses, and worst of all, by continuing to omit relevant facts from his reports revealing alarming conflicts of interest and that entire news stories and "awards" are being whole-cloth contrived within the US State Department and Soros media machines. For Pravit, and those that gravitate around his disingenuous message of "open society," "democracy," "equality," and "transparency," they are doing just as much to damage real freedom and progress by supporting dubious, foreign-funded propagandists like Prachatai and their sponsors' PR stunts, as they claim their political opponents are doing. A truly informed public, given accurate information by truly independent journalists and researchers would make the existence of fraudulent foreign-funded organizations like Prachatai impossible. Likewise, the duplicitous work of Human Rights Watch, which does more to justify wars and atrocities via Western military intervention than it does to stop such atrocities, would also be difficult at best if people realized who funds them and why. It is public ignorance and apathy that creates such fertile grounds where these lies continue to breath life and carry aloft the global elite's agenda. For another well-documented example of globalists contriving legitimacy for their propaganda fronts, please see, "Globalists Self-Aggrandizing."